Child development through Challenger’s nationally acclaimed innovative pre-school soccer program! Challenger’s soccer experts and child development professionals have designed an innovative curriculum that introduces your young soccer stars to the basic skills needed in soccer as well as developing their motor, social, and psychological skills. Our International coaches are experts at working with young children and will combine soccer with fun games; stories and music that keeps your children entertained and enthused to return next week. Come join our CUBS AND LIONS PROGRAM and join LENNY THE LION as you learn our Tiny Tykes theme song! Qualified Professional British Coaches (Ratio 1:10) with an abundance of experience working with young children and the knowledge of how to make it fun! 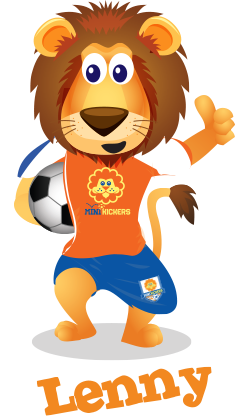 At the conclusion of every session each child receives a “Kicker Sticker” as acknowledgement of attendance, with a graduation certificate presented to each child at the final session of the level. Find a program near you now! I am a parent to 3 year old twin boys. Last spring and this past fall they participated in the TinyTykes program at their daycare, Discovery Point – Roswell with Coach Scott Hambleton. I just wanted to let y’all know how much we love the program and how amazing Coach Scott is with the kids. Being a parent of twins is challenging, and finding activities that both boys not only enjoy but thrive in is difficult. We tried many different activities before falling in love with TinyTykes. Because of the program, their gross motor skills have improved dramatically. We have also noticed a difference in their coordination, which is an area they have struggled with due to being premature at birth. Aside from their physical development, their independence and confidence have skyrocketed! My boys ask me almost every day, “when does Coach Scott come back? When is more soccer?”. Scott built such a rapport with all of the kids. He learned their individual personalities and tailored games and activities to their personalities. It is obvious that he not only loves soccer, but also that he loves working with kids and has a great understanding of early childhood development. We are looking forward to another season of TinyTykes in the spring! Through our extensive coaching network in NORTH AMERICA, EUROPE & SOUTH AMERICA, thousands of coaches apply to work for Challenger Sports. All applicants then go through a detailed Recruitment Process including interviews, coaching sessions, personality tests and background checks before they are selected to work on our British Soccer Camps, TetraBrazil Camps and based on their performance evaluations ONLY THE BEST are selected to work in the CHALLENGER SOCCER ACADEMY. Our staff are professionally trained to provide a magical learning experience for your child. In addition to being specifically prepared to work with this age and ability level, our staff are up to date with the current First Aid procedures, Child Safety / Safe Haven courses, Nutritional Guidelines and Injury Prevention. Learn from our staff who live and breathe the game. Many of our staff have played the game from grass roots up to the professional levels and have over twenty years experience playing and coaching! All our staff are further educated in our Challenger’s Academy Coaching Curriculum and will also receive on-going training and evaluation throughout their time over here. Throughout the recruitment process our staff go through in depth assessments, background checks, and VISA Processing to guarantee we select ONLY THE BEST! Check out our archived TinyTykes newsletters!